The last 48 hours have been rough. I fell victim to the infamous 24 hour flu and was sick in bed. I had just enough energy to sleep, sip water, take Tylenol, and pray that my fever would break. Thankfully, after 30 hours of slumber, I emerged from my feverish haze as good as new, perhaps a bit peckish. Okay, make that famished. I barely ate anything but my appetite has not yet return. I hope I’ll be back to 100% soon so I can resume my active and food-friendly lifestyle. In the mean time, I’ll share with you a couple of dishes I tested last week for upcoming publication of America’s Test Kitchen. A couple of years ago, I signed up to be a recipe tester for Cook’s Illustrated magazine. 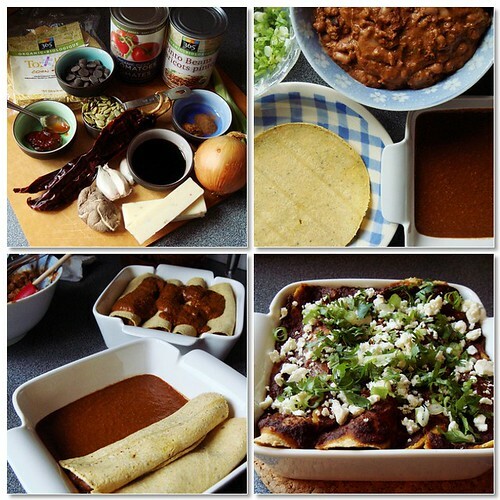 Recipes would arrive at my inbox occasionally and I would provide feedback after testing. Sometimes I would see an incarnation of the recipe appearing on newsstand a few months later. Sometimes not. But it’s all in good fun. I try to follow the recipe as close as possible and that means no ingredient substitution or using my usual technique. Last weekend started promising until I found out that something very important was misplaced. Like dominoes, the day just progressed from bad to worse and nothing went right from that point on. By the time I met up with M, I was so exhausted that a night out felt like too much to tackle. Thankfully, upon hearing my tales of woe, M uttered the magic words “I’ll take care of it”. Although he could not help me locate the missing object, he got us tickets to a much-anticipated movie screening. We enjoyed the 1979 animation Galaxy Express 999 at the TIFF Lightbox cinema. I was a kid when I last watched this movie and honestly did not understand what was the big deal. Watching it with adult eyes after all these years I finally appreciate the story of longing, rebellion, the pursuit of immortality, and that overwhelming sadness of losing one’s humanity. The only bright spot was my baking project. I bought a couple baskets of this year’s last harvest of sour cherries and turned them into pies. Pie baking is not my forte and I have my share of sad/soggy/leaky/tough pies. Last weekend’s specimen were none of those. 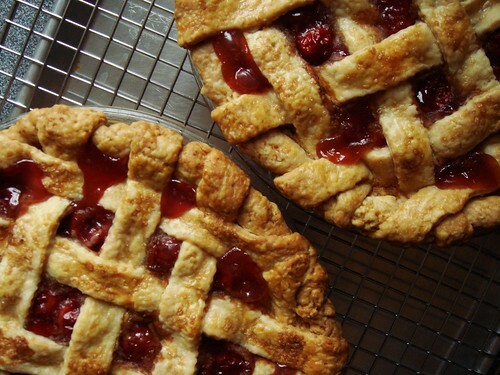 In fact, those Sour Cherry Lattice Pies ranked among one of my best pies to date. What a way to reclaim my weekend from a series of fails! I shy away from baking cheesecake for a long time. 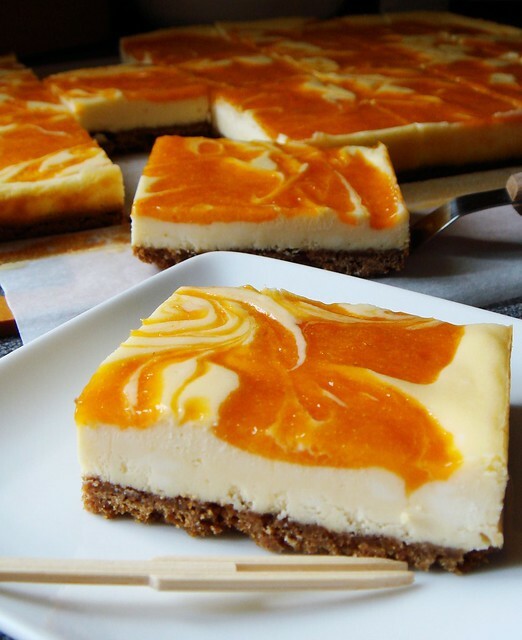 There was a time when a majestic New York style cheesecake graced my kitchen every few weeks. I was determined to master the craft of homemade cheesecake with mahogany top and creamy centre. And no cracks! That was the holy grail. Ambition fell to the wayside when I had my first taste of the golden standard. A slice of original cheesecake from Brooklyn’s Junior’s Restaurant left me discouraged. It was exactly what I wanted to achieve…without any of the work. Since then, I am happy to enjoy this special treat on my annual trip to New York City. Cheesecake disappeared from my repertoire. It’s interesting how the amount of money I spend on a purchase has little correlation to how much joy my purchase can bring. I’ve been dreaming of adding a waffle maker to my kitchen for years. 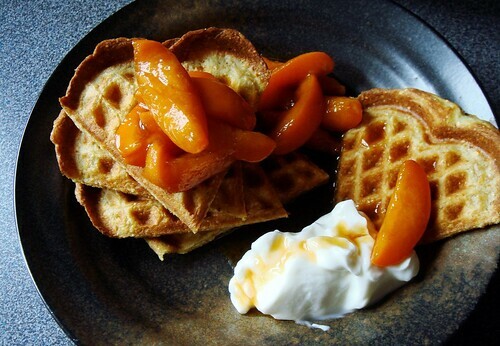 The promise of fresh-made waffles at home is enough to get my heart racing. I steadfastly resisted the temptation because I did not want to clutter my home with another single-purpose small appliance. When I read waffle maker reviews, I sighed with envy. When I saw well-honed waffle recipes that claim to achieve perfect balance between texture and taste, I was jealous of anyone with a waffle maker at home. I dreamt of the day I could start my mornings with waffles. Last week, I bid farewell to yearning and finally bought my own waffle maker. All because I found a legitimate excuse to justify my purchase! My friends and I are planning to run a waffle bar at a gathering next month. Although it is only an addendum to the real reason of the party, our group is known to go all out for food-related fun. Surely one Belgium-style waffle maker would not be enough for 50 waffle munchers. I jumped at the chance to run a second waffle station churning out traditional-style waffles. Do you have room for cake? Room in your stomach, room in your favourite jeans, room in your fridge, room among your friends? I hope the answer is yes because one of the best things about baking cakes is mixing and matching cake, frosting, and topping. Experimentation and tasting are always encouraged! 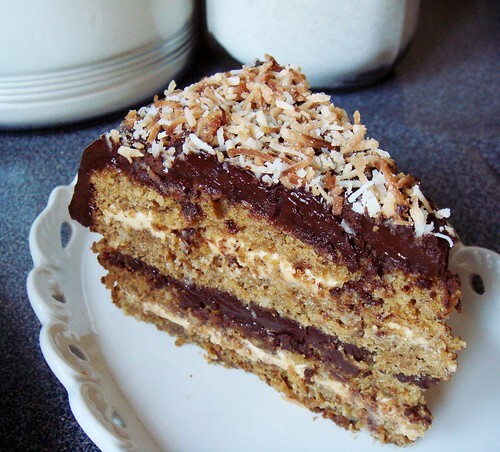 To put this mix-and-match theory to practice, I cobbled together this 4-layers Coconut Banana Cake with Dulce De Leche & Crème Fraiche Ganache. 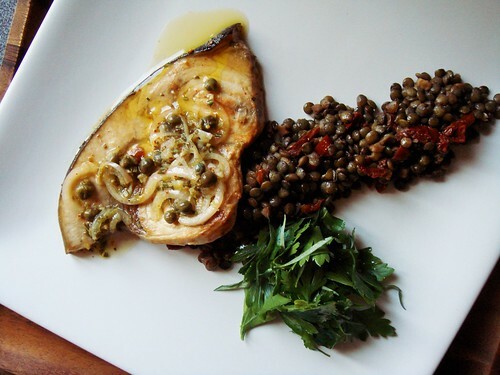 The recipes all come from different sources but they sure mesh well together! If you recall the Cake Day shenanigan from earlier this month, I don’t blame you for wondering how I recover from cake hangover so quickly. Like I always say: share the calories, share the love. I brought my share of cakes to a race the very next day. My skating friends and I shared a moment of cake-induced euphoria. It was awesome but it also left me without cake. Bake more cake was the only solution. With the current heat wave showing no signs of receding, I took my no-bake approach one step further to the dinner table. No cooking sounds awfully nice, doesn’t it? Last night’s dinner menu was not raw diet but it certainly approached the no cooking holy grail ever more closely. All the dishes were served cold, obviously. 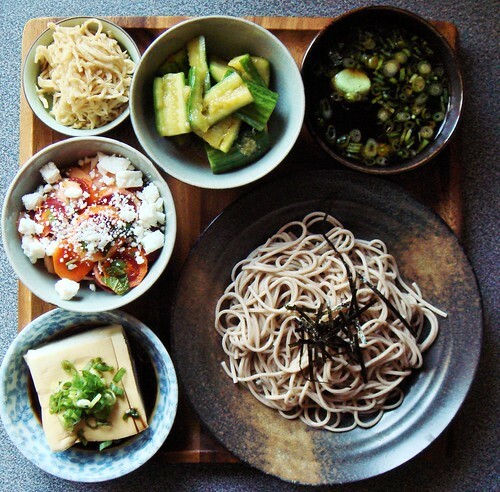 With the exception of boiling water to cook some soba noodles briefly for five minutes, I stayed far away from any heat. Everything was made from scratch too! I had a craving for cold noodles in the last few weeks. Whenever the topic of where to go for dinner came up, I would say something like “let’s go for Korean/Japanese/Northern Chinese food, they have cold noodles on the menu!”. M couldn’t grasp my obsession with cold noodles. It’s summer! 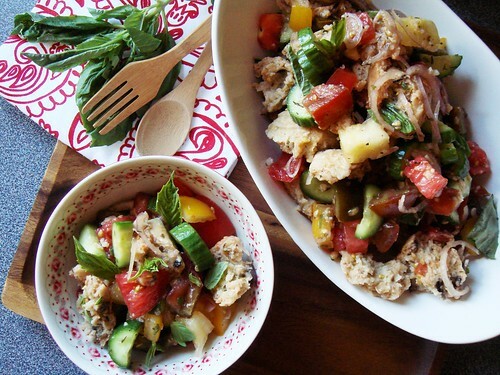 That’s what people eat in summer! The logic cannot be clearer to me. Until he pointed out, Asian people eat cold noodles in summer. Oooooh, oops. Cherry means summer and summer means hot. By that logic, unless I have very convincing reasons, I am not turning on the oven even for my beloved cherry pie. I made countless cherry dessert in the past but this year all I can think about is eating cherries for dinner. Good thing too because I am keeping my sugar consumption low. Cherry season is winding down in Ontario and I snapped up one of the last baskets of locally-grown sweet cherries this week. Tonight’s dinner is dotted with ruby summer treat. I am an advocate of combining in-season harvest into one big dish. 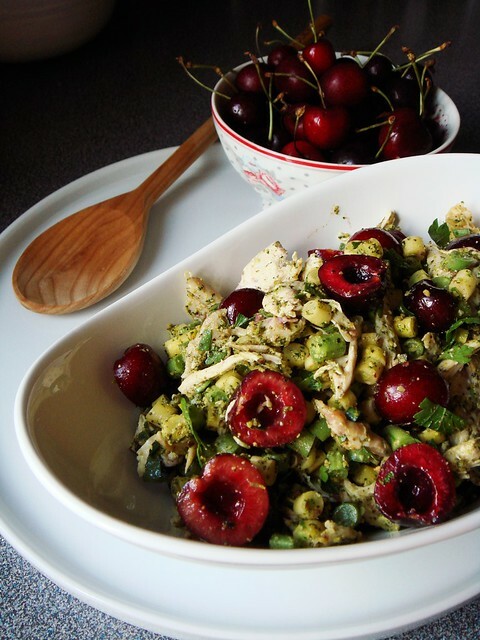 This Cherry Chicken Salad with Pistachio Mint Pesto fit perfectly into this philosophy. Sweet cherries, yellow beans, green beans, parsley, mint, and green garlic were all purchased at the weekly farmers market. The mint and garlic were made into the unusual pistachio mint pesto, a recipe I bookmarked long ago. The remaining ingredients were chopped and pitted and tossed with leftover store-bought roasted chicken to create a hearty melange of contrasting texture and taste. Boring salads are not allowed at my house. I don’t realize how rare I interact with kids until an occasion came up for Aunt Candy to spoil them. For the under-10 set, what do they like? What can they eat? What do they play with? I’m totally clueless. My hunch tells me that the boys have more toys than I can possibly imagine and probably more savvy with tablets and smartphones that I am. What do I do? Sugar and spice and everything nice! They’re not just for girls, you know. Last year’s M&M cookies were a hit with the boys but I wasn’t entirely happy with how they turned out. The cookies came out too flat. The boys loved them because the flatter shape meant palm-size monsters. But I think cookies ought to have some heft. 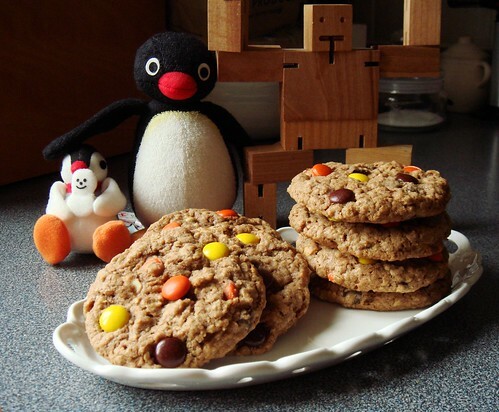 Oh yes, these Reese’s Pieces Oatmeal Cookie were just right. Aunt Candy and the boys approved!